Well, I was two-thirds right about the Dallas Cowboys in their Monday night 18-16 win over the Washington Redskins. I expected the battered Cowboys to win and thought that Rob Ryan’s defense would fluster Rex Grossman and, thus, lead to an ‘under’ total, which was easily the case. Unfortunately, the Cowboys missed covering by a few points as they became the first team this season to win without scoring a touchdown. Dallas hosts another unbeaten club on a short week as the 3-0 Lions come calling. It’s the first time that franchise has started 3-0 since 1980, and it will be another homecoming for Lions QB Matthew Stafford, a high school star in the Big D area and a potential NFL MVP candidate this season. The Lions have actually won 11 games in a row – the final four last year and all four preseason games on top of the first three of the regular season. I know preseason means squat, but for a young team trying to rebuild a winning culture, I think it’s relevant. And I will get to my pick at the bottom of this story, but here’s guessing it ends by a field goal. In a truly amazing stat, over their past nine games dating to last season the Cowboys have won or lost by a field goal or less every time. It's the longest such streak in NFL history — by three. Let’s get to the key injuries first. The big story heading into Monday’s game was the status of Dallas QB Tony Romo’s ribs, but he played the whole way and certainly will start this one. His top receiver, Miles Austin, missed Monday’s game and he almost certainly will miss this one as well. Both WR Dez Bryant and RB Felix Jones were questionable heading into Monday and both played. Bryant had a huge catch on third-and-21 that led to the Cowboys’ winning field goal. Jones finished with 115 yards on 14 carries, his second career 100-yard rushing game in the regular season. He did aggravate the shoulder he dislocated in Week 2 and didn't play on the Cowboys' final drive. But Jones also is expected to go in this one. 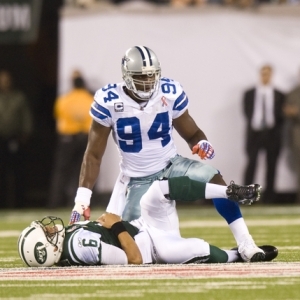 However, defensive end Jason Hatcher is unlikely to play this week after suffering a calf strain in the first half on Monday. With Hatcher out, Marcus Spears would move into the starter’s role at right defensive end. The Lions were hoping to have first-round pick Nick Fairley, last year’s Lombardi Award winner at Auburn, make his NFL debut in this game. But now it’s said the defensive tackle's chances to play are slim as he recovers from foot surgery. One big thing to keep an eye on here is the Lions’ offensive line. In last week’s win over the Vikings, in which Detroit rallied from a 20-0 halftime deficit, the Lions allowed five sacks of Stafford and rushed for only 20 yards. Right tackle Gosder Cherilus, a first-round pick in 2008, was pulled after just two series after being unable to hold back Vikings defensive end Brian Robison. As of this writing it’s not clear of Cherilus or the guy who replaced him, Corey Hilliard, will start Sunday. And left tackle Jeff Backus, one of the Lions' most veteran players, allowed two sacks and committed two false starts against stud pass rusher Jared Allen. Backus now will have to slow arguably the NFL’s top pass-rusher in DeMarcus Ware, unless Ryan moves Ware to the other side to take advantage of a lesser player in Cherilus or Hilliard. The Lions' average of 78.3 rushing yards per game ranks 26th in the league and they have only one run of at least 20 yards. Leading rusher Jahvid Best averages 2.9 yards per carry. But Stafford and Calvin Johnson have helped make up for it, with Johnson having his third game of two TD catches to become the first player in NFL history to catch at least two in a team’s first three games. The Dallas pass defense was porous last year, but it is now No. 12 in average yards allowed. But in fairness, the Cowboys haven’t exactly faced top QBs in Mark Sanchez, Alex Smith and Rex Grossman. It should be fun to see if the Lions’ defenders simulate the Cowboys’ snap count, as Dallas center Phil Costa accused the Redskins of doing Monday night (it’s a penalty if the refs hear that). Costa committed four bad snaps on the night, leading to a very frustrated Romo. As of this writing, Dallas is a one-point favorite with the total at 46, according to NFL odds. About 70 percent of the action is on Detroit. The Cowboys are 1-1-1 ATS this season with the Lions at 2-0-1 ATS. Detroit has covered eight of its past nine following a victory. It is 9-1 ATS in its past 10 vs. a team with a winning record. The Cowboys are just 1-6 ATS in their past seven as a home favorite. The ‘over’ is 4-0-1 in Detroit’s past five road games. It is 9-1 in Dallas’ past 10 at home. The home team is 4-1 ATS in the past five meetings. These two met in Big D in Week 11 a season ago, with the Cowboys winning, 35-19. I don’t read much into that because clearly both teams are better than they were at that point a year ago. Plus, neither Romo nor Stafford played. Despite the Cowboys being so battered and on a short week, I can’t avoid taking them giving only a point at home. They can focus on double-teaming Johnson and having Detroit try to run to beat them. I do like the ‘over,’ however. Final score: 27-24 Dallas.